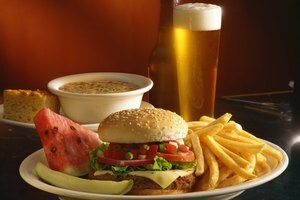 Hamburgers may be one of those quintessential grilled foods – and there's no denying that grilling is an excellent way to prepare them – but they can come out just as juicy and flavorful when cooked in the oven, baked or broiled. 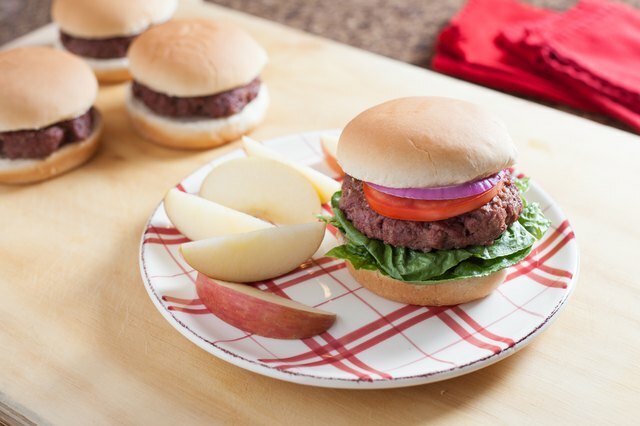 In fact, cooking hamburgers in the oven is a little less hassle than preparing them outside on the grill. And this is all good news if you don't have a grill or there's a torrential rainstorm raging outside. It also involves less splattering hot oil than frying burgers on the stovetop. There are plenty of cuts of ground beef available in the supermarket. Ground chuck is the way to go for simple baked hamburgers or broiled burgers that turn out deliciously juicy. It has a fat content of 15 to 20 percent. While higher fat content sets off alarm bells in some people's heads, it's your friend when it comes to making hamburgers in the oven. 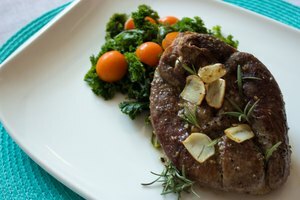 That fat doesn't only provide flavor, it also adds moisture and helps the meat hold up to the heat. Ground sirloin and ground round are decent second choices if you can't get your hands on ground chuck. 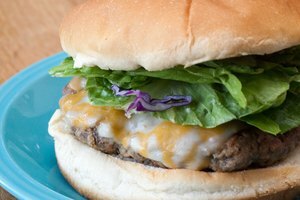 Ground sirloin produces burgers with lots of flavor, but they're likely to be a little on the dry side. Ground round holds its moisture better, but it's less flavorful than the others. Skip the packages generically labeled "ground beef," as you never know what you're getting. If you don't properly season the ground beef, your burgers will turn out fairly lifeless. Spread the meat in a bowl, and then add a liberal amount of salt and pepper, along with any other seasonings or aromatics you want. Garlic powder, onion powder, chili powder, red pepper flakes, dry mustard and oregano are a few options. You can also add things like minced garlic, onion, shallot or bell pepper, or even a splash of steak sauce, Worcestershire sauce or hot sauce. Wet your hands to prevent the meat from sticking to them. Lightly fold the seasonings into the ground beef, then loosely form it into patties about 4 inches across and 3/4- to 1-inch thick. The key here is to work the meat as gently and minimally as possible; the more you compact it, the denser and chewier your burgers will turn out. To end up with flat burgers, make depressions in the center of the top of the patties with three fingers, which prevents them from ballooning during cooking. Put a lightly greased baking tray or cast iron skillet on the center rack in the oven while you preheat to 350 degrees Fahrenheit. Heating up the tray or skillet ahead gets you a better sear when you put the patties on it, creating a tasty crust that helps seal in the meat's juices. Place the patties on the tray and bake them for about 10 minutes. Then, flip them carefully with a spatula and bake them for approximately another 7 to 10 minutes. Cooking time varies by oven, thickness and density of the patties, and other factors. 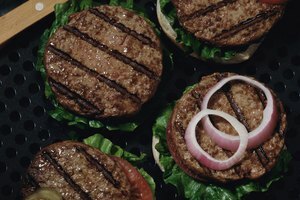 When baking hamburgers, temperature is the safe way to determine doneness; use a meat thermometer to confirm that they've reached 160 F at the center. If you're making cheeseburgers, put the cheese on top of the patties for about the last 2 minutes of cooking time so it gets nice and melty. Broiling is another option for cooking hamburgers in the oven. It's faster than baking, and it's better for creating a more developed crust on the outside of the burgers. Depending on whether your broiler is below the main oven chamber or in it, position the broiling rack or an oven rack far enough below the broiler so that the top of the patties will be 3 to 4 inches below the heating element. Preheat a foil-lined broiling rack or a lightly greased baking tray or cast iron skillet while you preheat the broiler (if your oven has different broiler settings, preheat to high). Broil the burgers for about 3 minutes per side, until they read 160 F at the center on a meat thermometer. Place cheese on top of the patties for about the last minute of cook time.